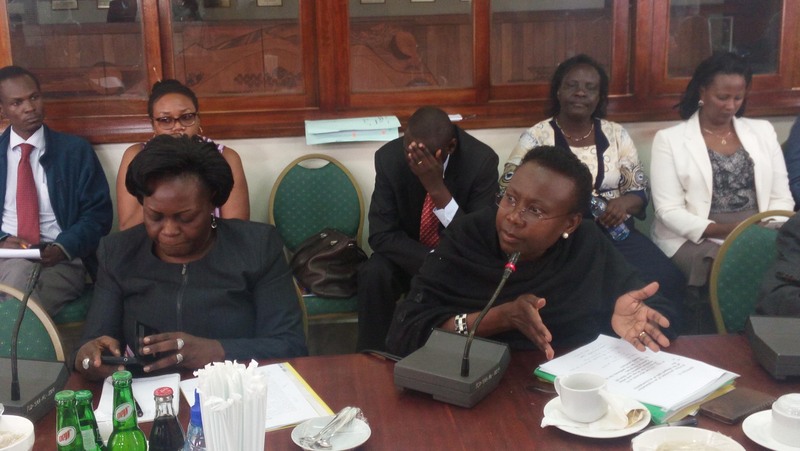 Health minister Ruth Jane Aceng flanked by state minister for health Sarah Opendi Achieng makes her point when she appeared before the House committee on September 5. Photo by Vincent Kasozi. Fears that Uganda’s recently acquired cancer machine is outdated and unsafe for patients have been allayed by the ministry for health. Health minister Ruth Jane Aceng told Parliament’s committee on health this morning that the machine is a brand new and safe Cobalt 60 machine. She explained that the latest linear accelerator machines use electricity and, therefore, cannot be reliable in a country with intermittent power supply — which is why the ministry settled for the Cobalt 60 which uses radiotherapy. She told the committee that there is no country in Africa that can do without a Cobalt 60 machine. A few press reports have recently suggested that the machine which arrived at Mulago National Referral Hospital last month is not safe for cancer patients since it uses old technology, causes many side effects and treats fewer cases per day. At the same meeting today, the deputy director Uganda Cancer Institute, Dr Victoria Walusansa, assured MPs that after the radioactive and non- radioactive parts of the machine have been assembled the machine should be ready to work by the end of October. “Installation time is about one month. So, give and take end of October or early November the service will be in the country,” Dr Walusansa said. Ministry officials were summoned by the committee to comment on progress on the cancer machine installation as well as the refurbishment of Mulago Hospital, and status of oxygen plants for 13 regional referral hospitals. The ministry defended the delayed installation of oxygen plants at a number of regional referral hospitals. Thirteen oxygen plants were meant to be installed at all of the country’s regional hospitals with Naguru Hospital chosen as the lead beneficiary on May 30, 2016. But to-date some hospitals remain without oxygen plants despite Shs 15 billion having been provided for the project. Aceng said that the contractor has completed supply and installation of 8 out of the 13 plants. She says the completed plants were handed over and are in use at Jinja, Hoima, Masaka, Kabale, Fort Portal, Lira, Gulu and Mbale hospitals. that buildings for the oxygen plants are complete in four other hospitals and plant equipment manufacture has been completed with installation expected soon. Aceng, however, disclosed that work has not started at Naguru because of delayed approval of plans by KCCA and NEMA. “Changes were made and resubmitted and then an Environment Impact Assessment was carried out, we are still waiting for reports from KCCA and NEMA.” Aceng explained. She also notified MPs that the project scope had been revised to include 269 oxygen cylinders which had been excluded in the original contract. She said this caused the project cost to shoot up from $ 1.8 million to slightly over $ 2 million.